Akshar yoga academy is one of the leading yoga institutions providing health services to over half a million people around the globe with both online and offline platforms conducting regular workshops to bring yoga closer to everyday life. Akshar Yoga is an internationally certified organisation with its 1800 teachersspreading the art and knowledge of yoga all over the globe. Akshar, popularly known as Grandmaster Akshar is one of the youngest yoga entrepreneurs in the country. Hailing from the oldest school of Himalayan yoga, he is an internationally acclaimed Yogic Master and visionary. 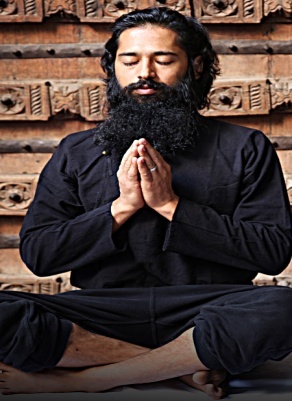 Akshar has carved a unique niche in the global wellness map by innovating with Yoga, weaving together his ancestral wisdom from the oldest form of Himalayan yoga with the most advanced forms of fitness regimes. He is the Founder, Chairman and Course Director of the Yoga foundation, Akshar Yoga. Akshar is noted amongst the leading yoga practitioners of the world; he travels extensively, learning and spreading the art of yoga, building new forms and creating opportunities for yogis all around the world. Akshar has been associated with yoga since his early childhood and has been practicing from the last twenty one years. Akshar Yoga is the brainchild of Grandmaster Akshar, conceived to reconnect with humanity through Yoga. Trained under 28 masters, Akshar conceptualized the form of Akshar Yoga by modifying his teaching techniques, adapting to the current generation and instilling them with great love, compassion and sincerity. He is also an established tutor of this advanced form of Yoga and conducts master level Teachers Training courses across the globe. The courses are skillfully designed for serious practitioners of yoga, who want to acquire and spread deeper knowledge on the most ancient form of yoga in its most pristine and diverse forms. Grand Master Akshar and his team train more than 250,000 students all over the world via both online and offline platforms. Grand master Akshar now has sixteen schools in the country under the Akshar Yoga banner and further expanding all over the globe. In an exclusive email interaction with The Motiverge; Akshar- Founder, Chairman and Course Director of the Yoga foundation, Akshar Yoga tells more about the venture and future plans. I completed my schooling in Kendra Vidyalaya and perused my bachelors from Dronacharya College, Gurugram. I started practicing yoga at the age of six. Kaulanthak, the oldest lineage of yoga in Himalayas is the place where I have been receiving guidance and training till date. 2. Tell us more about Akshar Yoga. When was it established? Akshar yoga, the leading yoga institutions is the medium that connects the traditional yoga to modern everyday life. With a team that works 24×7 to bring the motto of “health, peace and happiness” to life in every individual, Akshar Yoga strives to spread a healthier and happier standard of living to people throughout the world. Established in 2010, Akshar yoga provides expertise in Power yoga, Ashtanga yoga and Hatha yoga. It has created a structured curriculum of yogic traditions that are taught to yoga practitioners that may have aspirations to adopt a career in the field of yoga. What began as a single yoga studio, a place where I could express the art form of yoga for the benefit of the people, grew so organically and naturally to what is now 20 yoga academies throughout Bengaluru. Now, with the rest of the world set in our sights, only time will tell where this journey will take me. We are a team of 60 people with the support and encouragement of 200 volunteers who are an active part of the yoga community we have tirelessly created. 5. How Akshar Yoga is intricately structured to reach the various constituents of society while spreading the knowledge of yoga across the globe? Our basic fundamentals are “product and service ” and “delivery to the client”. It was a very humbling challenge as I entered this field of entrepreneurial yoga since there was no structured syllabus or curriculum to justify the investment of time and effort of the clients. It was also crucial to create taste and curiosity in the minds of the people since the concept of yoga for health and fitness was not so easily accepted by urban metropolitan lives. We are glad to see that the outlook of people towards yoga has been so positive and has facilitated in Akshar yoga growing into the largest chain of yoga centres throughout the nation. Expertise in manufacturing of various yoga accessories namely, mats, clothes, etc. Yoga is ever growing to become a major health industry that aims to heal the mind as well as the body. 8. What are the major health benefits of unique form of yoga, ‘Desk Yoga’ for corporates? Why do you think everyone should practice yoga on a regular basis? Yoga helps to keep people healthy, focused and happy. Practicing yoga every day is an easy way to maintain health both of the body and of the mind. Ultimately, it will transform them to become a more productive member of the company and society as well. 9. What are the challenges faced in your journey as an entrepreneur? For an entrepreneur, there are no challenges but only opportunities. With a positive outlook, any circumstance can be approached as a medium to success. To bring yoga to as many people as we can and create more opportunities for yoga as a career option for teachers, manufacturers, entrepreneurs, etc. Akshar yoga expects to expand to 50 schools worldwide by the year 2019. 12. What are your messages for budding entrepreneurs/young generation? Be creative and give your mind the space to think powerful thoughts. Rise to reach your expectations for yourself and surpass them.